Over the last few months, I have written about my ongoing research. In brief, the odor code in the olfactory bulb is known to be highly dynamic over the course of a single breathing cycle. 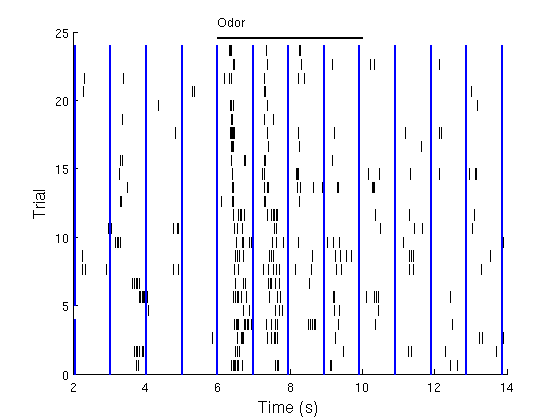 I have found that there are inter-breath dynamics as well: that is, the odor code during the first sniff of an odor differs from subsequent sniffs. Furthermore, I found that odor-specific information persisted in the olfactory bulb after the odor was no longer present. I thought this was a decent finding, and wanted to push it out, but mon chef wanted to beef the paper up by identifying the (or a) mechanism. The two most obvious mechanisms for inter-breath and post-odor dynamics are dynamic input from olfactory receptor neurons, and feedback from "higher" olfactory areas. Olfactory receptor neuron dynamics have been reported in flies before, but not well observed in mammals. However, we are not well equipped to record from ORNs at the moment. Feedback, on the other hand, is more virgin territory, and easier (for us) to manipulate. I'm working on a few experiments regarding feedback. The first one involves dissociating the feedback and olfactory input, by removing the direct olfactory input; in other words, I blocked the nose, leaving only feedback.. I recorded from the left olfactory bulb of anesthetized mice using tetrode arrays. Prior to each recording, I blocked the left nose using a liquid plastic, liberally lathering the ipsilateral nostril. I am confident I got near complate blockage, for: 1.) when I removed the plastic, it outlined the inside of the nasal cavity; 2.) the nasal pressure in the contralateral nostril doubled after blockade; and 3.) there was almost no odor information in the ipsilateral olfactory bulb. With the nostril blocked, I recorded the mitral cells' response to a set of odors, then removed the block, and recorded from the same neurons with the nostril open. Blocking the nostril significantly reduced the activity in the olfactory bulb. With an open nostril, most (putative) mitral cells fire at 10-20Hz. With the nostril blocked, the firing rate was ~4-5Hz. There were some cells which were almost silent in the blocked condition, but which fired vigorously once the nostril was opened. Raster plot of one cells' response to Amyl Acetate. Spikes shown as black lines, breaths as blue lines. During the first twelve trials, the nostril was blocked, and the cell fired infrequently. Once the nostril was open, the cell fired vigorously, in phase with the breathing cycle. I recorded from 91 cells in 3 animals at ten recording sites to generate 400 cell-odor pairs. Of the 91 cells, only one cell displayed phasic firing during the breathing cycle in the absence of odor. Of the 400 cell-odor pairs, only 5 responded to odor. One of five cell-odor pairs to respond to odor. While the nostril is blocked (first twelve trials), the neuron has a broad, phasic response. With the nostril open, the neuron refined its timing. Of note, the neuron responded to 1/3 odors when blocked, but 3/3 odors when open. How does one interpret these sparse responses? One might claim that they are due to a leaky blockade, and that this subset of cells are highly sensitive. I would argue against this, because more neurons recorded in parallel had no response. Furthermore, I think I did a competent job. Ultimately, to show that this is not a leaky blockage, one would need to record from these neurons while presenting very low concentrations of odorant, to compare to the blocked condition. This would be a lot of work for relatively little gain. The take-home message here is simply that mitral cells in the olfactory bulb receive a vast majority of their excitatory input from ORNs. Whatever feedback may be present must modulate the signal, rather than drive it. While the feedback in the blocked nostril condition is not strong enough to drive spiking, that does not mean there's no feedback. 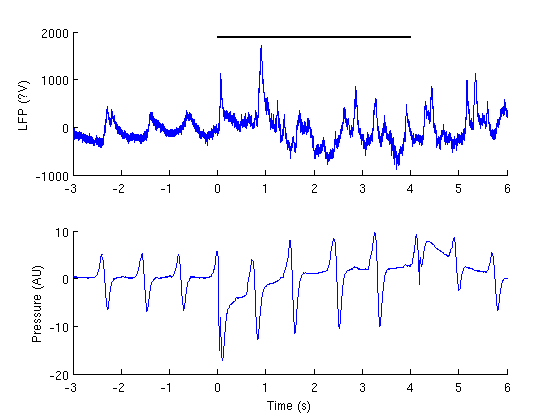 To examine sub-threshold input, we looked at the LFP on electrodes which contained spikes, and saw that the odor presentation was causing oscillations in the LFP. LFP (top) and nostril air pressure (bottom) during presentation of odor (black bar from 0-4s). Before the odor, the LFP has little power except at ~1Hz. During and after the odor, the LFP is moderately active. To determine whether this was real, I calculated the LFP power using FFTs, looking at the periods 3-4 seconds before, during, and after the odor. 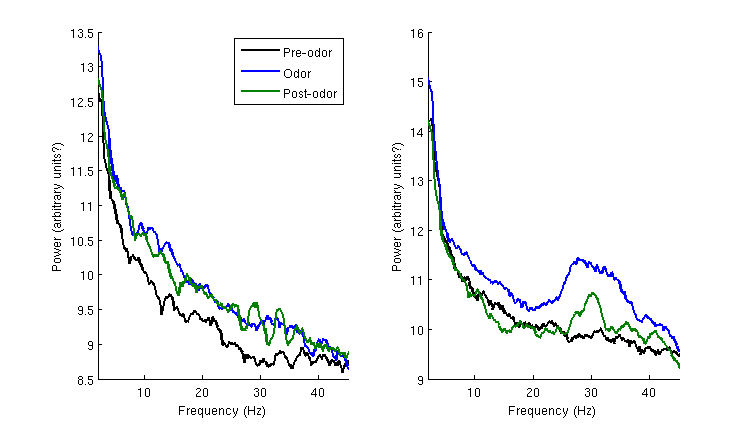 For ~7/10 recording sites, the LFP power was higher during the odor and post-odor period, for frequencies in a range from 5-30Hz (see below, left; eye-test). For comparison, I also calculated the LFP power with the nostril open. With the nostril open, the baseline power is higher, reflecting the increased spiking. During the odor, there is an increase in power at all frequencies, and especially in the gamma range. Log power for one recording site with the nostril blocked (left) and open (right). In the blocked condition, during odor presentation, the LFP power increased in the 5-35Hz range, and remained elevated during the post-odor period. For the open nostril, the baseline power is higher. During odor presentation, there is a large gamma frequency band. To test whether this was significant, I pooled together the results of the ten recording sites, and performed an ANOVA by calculating the power for each experiment at 5,10,...30Hz. 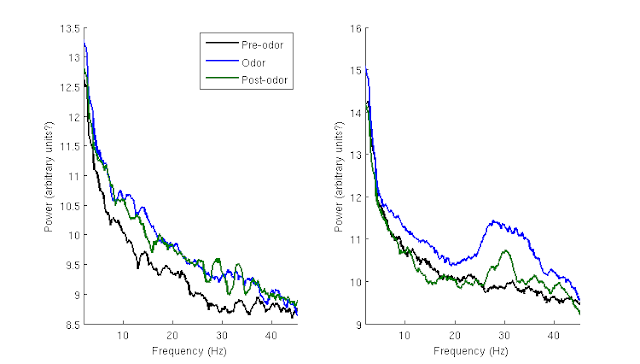 There was a statistically significant effect of the odor presentation on the LFP power (p<0.05). Average LFP power for blocked nostril (left) and open nostril (right). 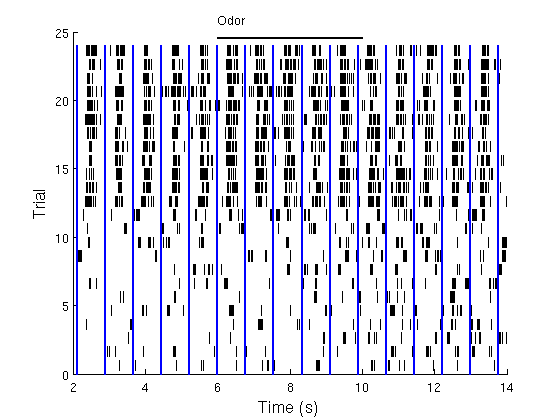 The main conclusion from these experiments is that during odor presentation, in the absence of direct olfactory input, the OB still receives neural input, presumably from higher processing areas. These are the first LFP measurements I have done, so I am not expert at interpreting them. However, my understanding is that higher frequency (30+ Hz) LFP oscillations reflect local processing, while low frequency oscillations reflect longer distance connections. You can see that in the final figure abovewhen the nostril is open, the OB receives direct olfactory input, is quite active, and there is power in the gamma frequency; with the nostril blocked, the gamma frequency disappears. The fact that the LFP power in the blocked nostril condition is at low frequencies is in accordance with the idea that it is feedback from higher (more distant) areas. I am not the first person to record from olfactory neurons while blocking the nostril. The Mori lab recorded from the olfactory bulb and anterior olfactory nucleus while blocking either the ipsilateral or contralateral nostril. They found that all mitral/tufted cells responded only to ipsilateral odor inputs, while AON neurons could respond to both contralateral and ipsilateral inputs. Of AON recordings, ~40% of cells were ipsilateral-exclusive, while 60% responded to bilateral inputs. Interestingly, the AON cells had highly overlapping odor "receptive fields" for ipsilateral and contralateral odorants. Mitral cells respond exclusively to ipsilateral odorants, while AON neurons can respond bilaterally. A. Diagram of recording apparatus. The odors were applied focally via an external septum, and chitin membrane. B. No mitral/tufted cells responded to odorants from the contralateral olfactory bulb. 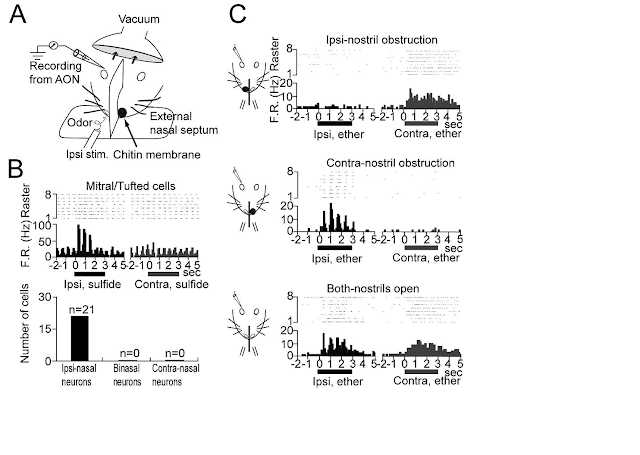 C. Example AON neuron responds to both ipsilaterl and contralateral odor presentation. They also found that ipsilateral blockade removed the phasicness of the baseline response, almost silencing the AON neurons. Interestingly, after a few hundred seconds, this phasicness was restored, presumably from contralateral inputs. My experiment confirms their basic result in the olfactory bulb: almost no mitral/tufted cells spike in response to contralateral odor input. However, I do find that there is some sort of sub-threshold, contralateral input in the olfactory bulb, as evidenced by the LFP. After reading their paper, I wish I had also recorded from the olfactory bulb while blocking the contrlateral nostril, to see if that modified the odor receptive field.